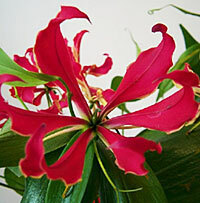 Gloriosa lily, commonly known as the climbing lily, is surely one of the most exotic varieties within the lily family (Liliceae). The wavy petals of its flowers are bright crimson edged in gold, reminding us of 'blooms in fire." The glossy leaves are tipped with tendrils to aid in climbing. A native of South Africa, Gloriosa has traveled far to be enjoyed in America. These beauties are sure to create a bright and joyous atmosphere anywhere in your home. 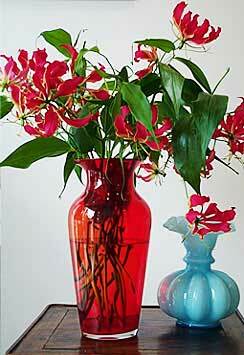 The arrangement above was created with 10 stems of freshly cut Gloriosa Lilies. Each purchase includes care instructions and an exquisite gift card for your personal message. Each stem is approximately 18-20 inches tall and comes with an individual water vials. The flowers measure approximately 5-6 inches in diameter. 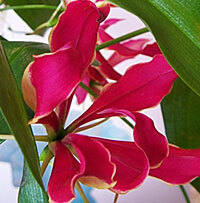 Gloriosa's availability is based on limited supplies and at times will not be available. If the lily is currently unavailable, you will be contacted prior to any substitution. Feel free to contact us and we will inform you of the exact quantities we have on hand at 1-877-267-2443.